Freeport, Bahamas - The Grand Bahama Labyrinth at the Garden of the Groves will play host site to a Remembrance Day Global Unity event on Friday, November 11th, 20 11 at 11 am. We will begin to gather at 10.30am. All are welcome to this simple gathering, which is intended to be a unified oneness in a structure of remembrance. 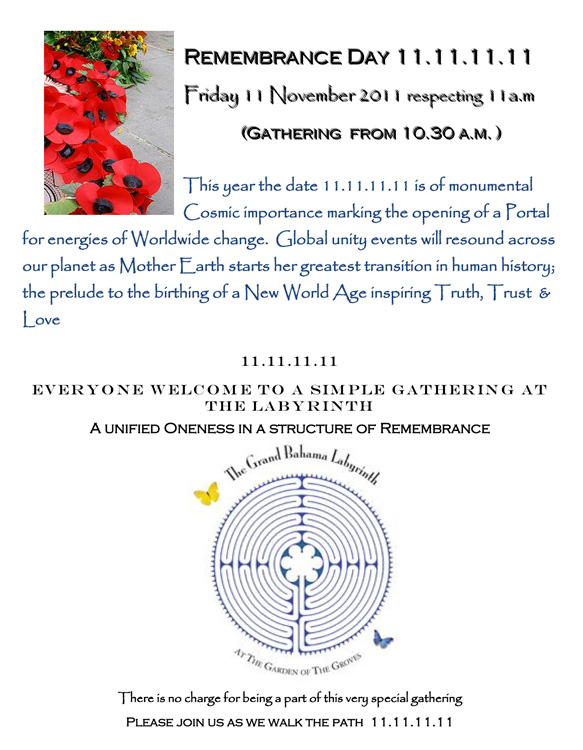 This year the date 11.11.11.11 is of monumental cosmic importance marking the opening of a portal for energies of Worldwide change. Global unity events will resound across our planet as Mother Earth starts her greatest transition in human history; the prelude to the birthing of a New World Age inspiring Truth, Trust and Love.